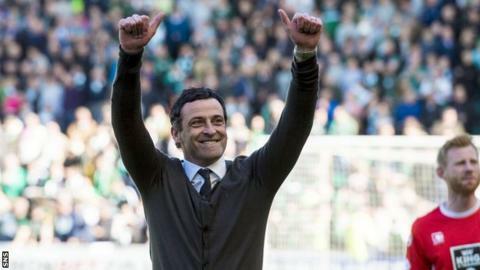 St Mirren chief executive Tony Fitzpatrick says Jack Ross may never better the feat of keeping the club in the Scottish Championship. The Buddies were bottom of the table as recently as 8 April. But Saturday's 1-1 draw at champions Hibernian ensured they avoided a relegation play-off. "He's going to have a big career, this guy, but he'll never match this," former Saints captain Fitzpatrick said of Ross. "That's how big this was. To turn the whole thing round is miraculous. "I go back to Sir Alex Ferguson's time as manager and I've never seen Paisley like this. "Even when I played in 1987 and we won the Scottish Cup, I've never seen Paisley galvanised behind their time the way they're doing just now, and that's great credit to that young manager." Ross succeeded Alex Rae as manager in early October, with St Mirren propping up the table on four points. The former Alloa Athletic boss undertook a January overhaul of the squad, shipping out 10 players and bringing 10 in. "People said we spent a lot of money, we haven't," Fitzpatrick, who played for and managed the Buddies, added. "That man put 10 players out, 10 in, with hardly any budget - that's the mark of the man. "We got some money in from (Jason) Naismith (moving to Ross County), which was a big call for Jack at the time because Naismith had been back to his best, but we let him go early. "This guy changed the whole thing, went and engaged with supporters, but it was the cleverness of what he did. "It was horrible hearing other managers saying St Mirren have bought their way out of it - nonsense. It was great management that got us out of this and players who have bought into the manager." Fitzpatrick insists the club will do its utmost to keep Ross's current crop of players together, in spite of likely suitors for young talents such as Stevie Mallan, and is adamant St Mirren ought to be competing in the upper echelons of Scotland's top tier. "We've got a long-term plan in place for the club," he said. "The next step is trying to keep this team together, and I know Jack's desperate to do that. "The club have made the decision to try and keep every young player they can. Of course they've got ambition and there will be a time they can move on, but we've got to get this great club back into the Premiership. "We're a top-six club in the Premiership, even top-four, and we'll not rest."